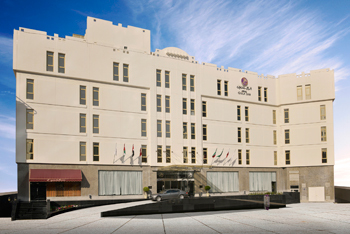 Asdal Gulf Inn, formerly operated as L’Hotel, has joined the Gulf Hotel Group’s portfolio in Bahrain as a boutique hotel in the kingdom. The property, based in Seef district, is owned by Saudi-based Asdal Hotels and operated by Gulf Hotels Group under a hotel management agreement. Asdal Gulf Inn is a four-star deluxe boutique-style property that boasts modern facilities and caters to the business traveller. With a spacious meeting room, contemporary business centre and underground parking, the hotel is spread over four floors and houses 89 fully renovated luxurious rooms and suites. Three restaurants, serving Italian and Lebanese cuisines along with an all-day dining outlet, and a mini-gym, rooftop swimming pool and sauna are offered. The hotel is situated at just walking distance to major shopping malls, 15 minutes from the Bahrain International Airport and a short distance to Bahrain International Circuit (venue of F1). The hotel boasts a U-shaped conference room which is good enough for 35 guests. Its chief source markets are the corporate and leisure sectors in Bahrain and Saudi Arabia and the leisure market from GCC countries, says general manager and industry veteran, Hans Radek whose 40-year career includes more than a decade’s experience in Bahrain’s four-star hotel sector. Radek says the hotel will take part in major national and international exhibitions including the Arabian Travel Market, Dubai. It also has tie-ups with major airlines in the region including Gulf Air, Emirates, Qatar Airways and Etihad Airways. The theme of the hotel’s interior design generally is modern and contemporary, while it Lebanese restaurant, The Sultan, has a typical Andalusia design with Turkish and Lebanese twist, he says. The interiors of the hotel has been designed by Interdesign International – IDI and great care has been taken to make it environment-friendly, he adds.